INTENTION. No matter how one reacts to the content, I think that the producers and correspondent/narrator deserve praise for seeking to reopen these cold cases in the hope of bringing the murderers to justice. The scene with a son of Nguyễn Đạm Phong, shown shortly after the opening credits, is enough of a reminder that the pursuit of justice for the deceased journalists and writers is worthy and worthwhile. In particular, A. C. Thompson, the correspondent and narrator, should be appreciated for his doggedness in finding answers, including travels across the U.S. and to Thailand. FRONTLINE. I think it’s important to acknowledge the limited scope of the documentary. It resembles an average episode of Dateline NBC or ABC’s 60 Minutes than the few Frontline documentaries that I’ve seen in the past. True, the historical quality isn’t strong. But I’d surmise that this topic would not be considered or accepted by Dateline NBC or 60 Minutes because, among other things, it may play against the narrative of “poor refugees” or “assimilating immigrants” in America. I am not too keen on “critical refugee studies” because it shifts the focus away from the refugees, whom I consider to be the main actors of their own stories. But it can be helpful as long as the focus is multi- than mono-focal, when criticism against American culture enhances the voices and action of refugees themselves. Such is the case here, as I don’t think NBC or ABC will touch on this topic. So let’s give credit where credit is due, including credit to Frontline for visiting this important aspect in the history of Vietnamese Americans. PROBLEMS WITH THE TITLE. But I also have serious problems with the documentary, starting with its title. It is unfortunate, to say the least, that it chose to show “terror” and “Little Saigon” in one breath. The combination of terms, especially in the singular form for location, is problematic. Does it refer to the designated Little Saigon in Orange County, California, the largest and best-known Vietnamese American community in the U.S.? If so, only one journalist was killed there: a sorrowful number, to be sure, but it is still one out of a handful. Two other murders occurred in Fairfax County, Virginia; one took place in Houston; one in San Francisco; and an unsuccessful attempt in Fresno. What “Little Saigon,” exactly? Or is “Little Saigon” meant to encompass all those different locations? Even all Vietnamese American communities? Moreover, “terror” takes on a somewhat more dramatic connotation since September 11, at least for Vietnamese Americans in Orange County and other large ethnic communities. Although “terror” and “terrorism” are not the same things, I’d wager that Vietnamese Americans, especially those for whom English is a second language, consider them just about the same. Placed together with “Little Saigon,” it is suggestive of a community steeped in unethical practices and illegal and extra-legal activities. 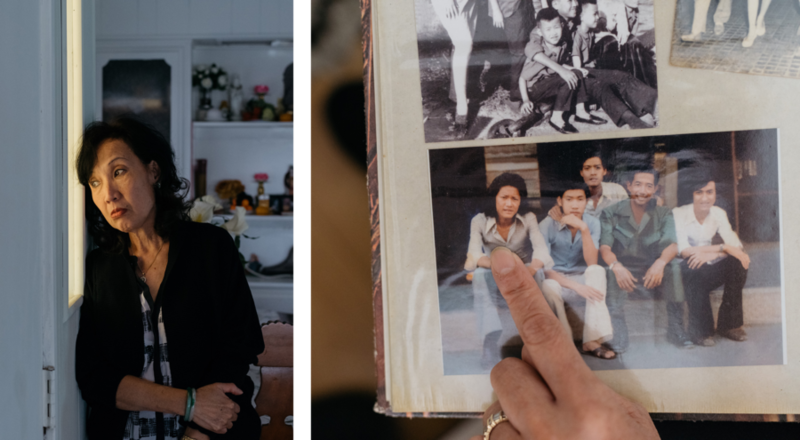 Was there intimidation and violence in Little Saigon? Yes – and it was not limited to the political arena. But I also think that for many Vietnamese Americans, the editing and presentation of evidence distorts the evidence and suggests that there was a persistent and pervasive culture of intimidation and violence in this community. In short, the unfortunate placement of “terror” and “Little Saigon” implies an overreached, unsubstantiated, and unnecessary generalization. Writer and producers strive for catchy titles, and this title is catchy all right. But it is also a mistake at more than one level. POOR HISTORICAL CONTEXT. Another problem is the correspondent’s reliance on Claudia Kolker, the former reporter for the Los Angeles Times, for the history lesson on the background about former South Vietnamese military officers. “For them,” said Kolker, “the war did not end.” There is some truth about this statement and some of the other points that she makes. But it is also incomplete and even distorted from a historical perspective. FALL OF SAIGON. It is too long to get into here, but the speed of the Spring Offensive and the rapid Fall of Saigon produced a profound shock to Vietnamese whose identity formed and/or derived from the Republic of Vietnam. As a resident of Little Saigon put it to me in a conversation last year, the Fall of Saigon was “like a dream”: “như một giấc mơ.” The horrible shock induced a range of reaction: depression, grief, hurt, sorrow – and also a desire to reverse the sudden loss and regain the old country. An outcome of this shock, a current subject of my research, was a psychologically reverse dream that the country could be freed of communism through force. Think, for example, of the well-known song Em Vẫn Mơ Một Ngày Về – I Still Dream of Returning One Day. It is a complicated subject, but the point is that the dream of liberating Vietnam from communism was widespread and not limited to some former officers and soldiers of the former South Vietnamese military. Understanding the larger context, of course, does not excuse the murders in any shape and form. But it helps to explain for the extra-legal activities behind the murders. VISIT TO A REUNION. On that note, the majority of former officers were not in the U.S. but in Vietnam during the period that the murders took place. To be precise, they were mostly in reeducation camps. For several reasons, I wish this point were made clear in the documentary. Indeed, one of the worst scenes of the documentary is Thompson’s visit to a reunion of former ARVN officers in San Jose. Because of the presumed association between former South Vietnamese officers and the Front, the presentation gives the impression of a close link between membership in the Front and the historically symbolic and ritualized practices – military uniform, martial music, anticommunist speeches, etc. – common at these sorts of events in large communities of Vietnamese Americans. I’d wager that the majority of the men at that reunion did not come to the U.S. until the 1990s, or after the last of the murders documented in the film. VIETNAMESE AMERICAN HISTORY. Other obligations await, and I’ll have to stop here even though there is a lot more about the documentary and even more about the history and context behind the unsolved murders. But I also think that the documentary unintentionally illustrates the need for greater and better scholarship on Vietnamese American history. Lost is the larger historical context. As my history students at Pepperdine can tell you, one feature about post-1880 Italian immigrants to the U.S. was the emphasis they placed on the extended family as the central social organization. Which helped to explain why they were not involved in American politics as, say, the Irish or Germans until a lot later. Or, more darkly, why the Mafia was different in membership when compared to organized crime from other ethnic groups. In this case, the context of national loss and martial identity, leave alone the long history of Vietnamese noncommunist nationalism and, again, the shocking Fall of Saigon, is entirely missing from the documentary. OTHER REACTIONS. My initial reaction comes out of sorrow rather than anger: I applaud the desire for justice; I bemoan the lack of historical and cultural context. But a number of Vietnamese Americans have been understandably upset at the documentary. I’ll add some of the links to these reactions after reading them. I think it is accurate to describe these murders as terrorism. While the number of deaths was not extremely large, the purpose of the murders was to silence a community and it was effective. Until the late 1990s many Vietnamese-Americans would never speak of any possible rapprochement with Vietnam. They would try to conceal the fact that they had visited Vietnam or were thinking of visiting Vietnam. You can see the silence to this date — the fear of naming the people who pulled triggers or conspired to commit these murders. The one detail in the documentary that struck me the most is how intertwined those involved with forming the guerrilla army and the related domestic political organizations were with the U.S. national security state. I thought it was very telling how much information was redacted from official documents. I came to the conclusion that these murders weren’t solved because elements of the United States government were working hard to assure that they wouldn’t be solved. If the murderers were arrested and tried, they might reveal information that would embarrass people in the U.S. government. You also could see the palpable frustration of the investigators who worked on these cases. I sensed that the raison d’être of the program had much to do with the worldview of journalists and journalistic freedom — from a believe that journalists have a duty to take the side of their colleagues no matter what community their colleagues are working in. Pursuing that concern probably overwhelmed their concern for a deeper understanding of the Vietnamese American community. So while there may be many who fear that it portrays the Vietnamese American diaspora and community negatively, I’m glad that these events haven’t been totally swept under the rug. It’s not impossible to call the murders and the intended atmosphere terrorism, but present the evidence and make the case. This, the documentary fails to do. To an extent, I agree with you on fear, concealment, etc. There’s no question that the assassinations, failed attempts, threats, and the like played a role. But I think it is also incomplete – quite incomplete – to attribute them to these acts of violence alone. The refugees in the 1970s and the 1980s had just participated in a very long, violent, and divisive war that pitted brothers against brothers (to use a cliche that, sadly, isn’t really a cliche in this case.) The “luckier” ones on the losing side got out in 1975, only to experience the challenges of adaptation on top of the pain of national loss and having families behind. Others, the boat people waves, endured the harsh life and discrimination under the postwar regime. Could one realistically expect them to do away with their suspicions and binary way of thinking and, instead, embrace pluralism in a matter of a years? (I haven’t even got to the post-1990 waves of OCD and HO people.) I surmise that there was a larger culture of conformity that met brutal wartime and postwar realities, and this combination created a culture of “silencing” (if that’s the correct word). There is something to be said about the violence and assassinations. But it’s convenient to attribute this “silencing” to the assassinations and miss out on larger historical and cultural forces at work. I agree with you about possible involvement of the U.S. government: there’s something fishy there. I’d add that Vietnamese were hardly the only refugees and immigrants in American history that wanted to overthrow the governments of their homeland. An example is the active involvement of Mexican immigrants in the Cristero War. But it’s a topic for another day, and perhaps something that Frontline can pursue. I don’t disagree with you about the overall picture being extremely complicated. And you rightly note that America has been the breeding ground for exiled groups to foment and organize against the governments in their former homelands, often with the clandestine or overt support of U.S. government organizations. I stick to the word terrorism because I think it’s accurate – here’s a criteria for terrorism according to the FBI: “acts dangerous to human life that violate federal or state law; Appear intended (i) to intimidate or coerce a civilian population.” I guess the only doubt here is very the motive in these murders was personal hatred (the journalist voiced an opinion that I can’t stand and therefore shouldn’t be allowed to live) and lacked the intent to send a message to the wider community. If one argues that that intent was not there, then there is no terrorism. I appreciate your nuanced view that there were other subtler forms of group coercion present in the community against return to Vietnam and cooperation with the government, but politically motivated sends a strong message. I see parallels between the underground communists in the 1930s and 1940s. Organizing in secretive cells in countries that either support or tolerate their activities, and of course the use of political assassination as a weapon. That was definitely part of the communist playbook and I call that terrorism as well. I think this group led by Hoàng Cơ Minh must have had illusions that if they could only get a foothold inside of Vietnam, enough of the people in Vietnam would be so turned off by the Vietnamese government that they could get a base of support as the communists did in Việt Bắc in 1944-5. I’m not as well read on the overseas Vietnamese groups as I should be – has anyone done scholarly research on these exilic paramilitary groups? I thought the footage and interviews conducted in Thailand and Laos were interesting. Yes, good points on motives and the legal meaning of “terrorism.” There’s a cultural side to it as well, which I think is why may diasporic Vietnamese are upset. Your point on underground organization is well taken because Vietnam had a long history of secret societies and (later) underground cells affiliated to revolutionary parties, both communist and noncommunist.